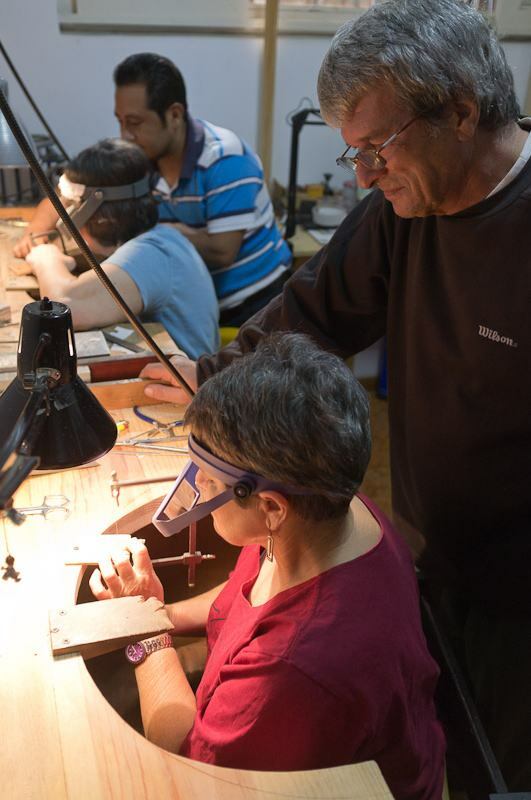 Beryl Simon from Boston, Massachusetts, signed up with us to take a sterling silver jewelry making workshop before she visited Oaxaca. 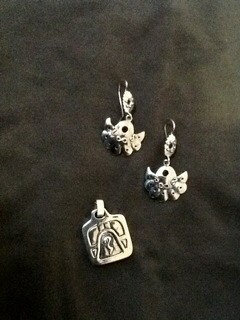 She wrote: I love working with silver! 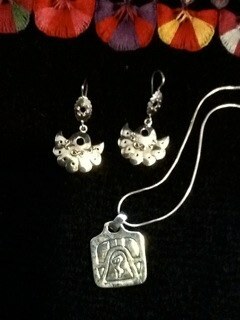 I have a passion for jewelry making and design, and would like to expand my skills. I also love the work created in this workshop that I see on-line. I invited Beryl to write about her experience. 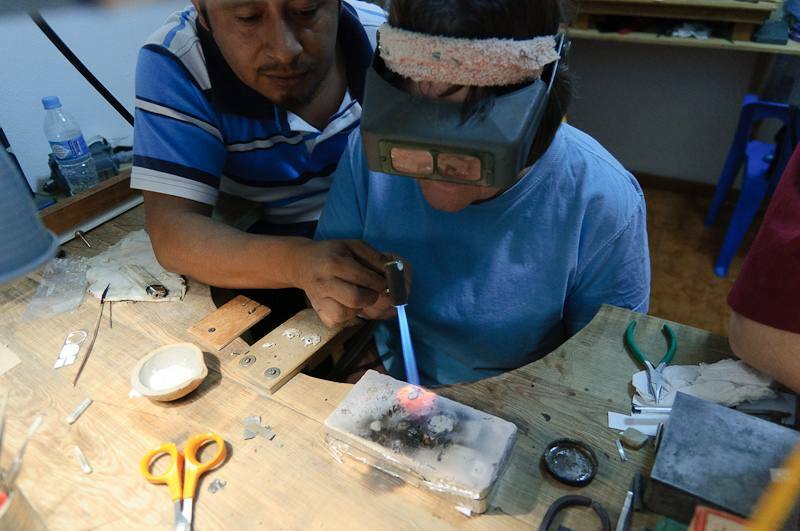 My recent trip to Oaxaca with my husband was wonderful in every way, but the high point for me was a three-day lost wax sterling silver jewelry workshop with Brigitte Huet and Ivan Campant. My dream was to work hands-on and one-on-one with master craftsmen amidst the color and charm of this beautiful city. And I took away not only the memories and new skills, but also a rather-professional-looking sterling silver pendant and set of earrings that I will treasure forever. On Friday morning, Day One of the workshop, I started out by taxi from our city center B&B to their home studio in a nearby residential area. In my enthusiasm, I arrived a bit early (sorry Brigitte! ), but was welcomed with a cup of tea and an introduction to two aging, friendly and adorable dogs. Then we got to work. 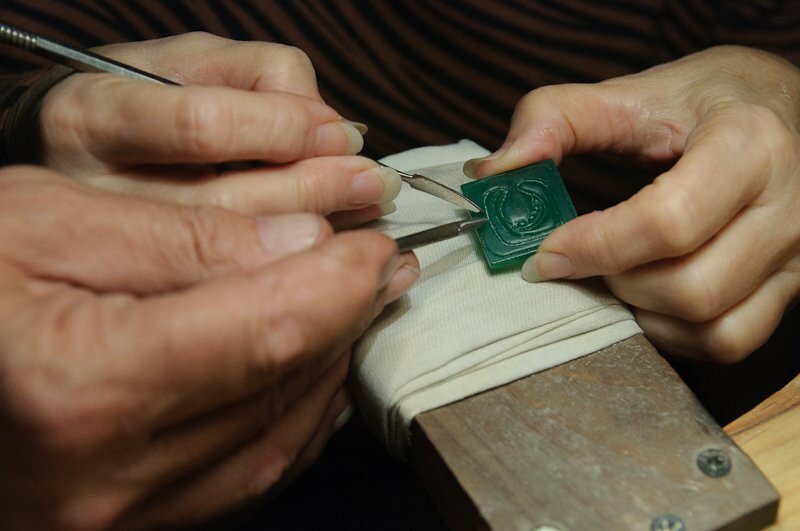 Lost-wax carving is an ancient and venerable tradition. Brigitte and Ivan showed me techniques that combine both ancient and modern techniques. It was fascinating. During the first day, I learned to carve a traditional design using simple tools. 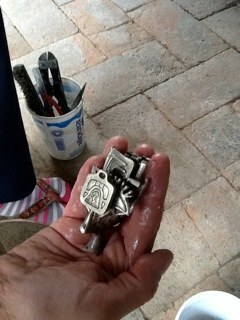 I must confess that I have no talent for carving wax! But somehow, Brigitte, with her patience and clear instruction, helped make it work for me. The difficulty of the wax carving process and doing it well made me appreciate even more the talent required to craft one of Brigitte and Ivan’s gorgeous creations. After a focused morning, we took a break for a delicious lunch, which we bought from a local street vendor. Brigitte made a tasty agua fresca (fresh fruit and water) drink and the dogs entertained us with some very cute tricks. And then, back to work. 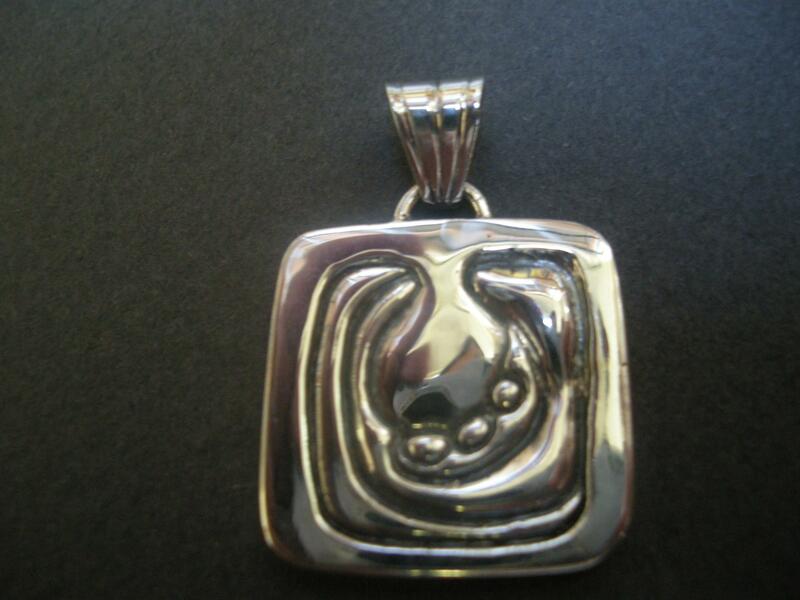 When I saw the sterling pendant I created, I was amazed. (I should mention that the cost of the silver is part of the workshop fee, making this a remarkable value.) Heating the mold for casting takes hours, and during the down time, Brigitte guided me through carving a second wax piece based on my own design. Someday, I hope to finish and cast this piece as well. 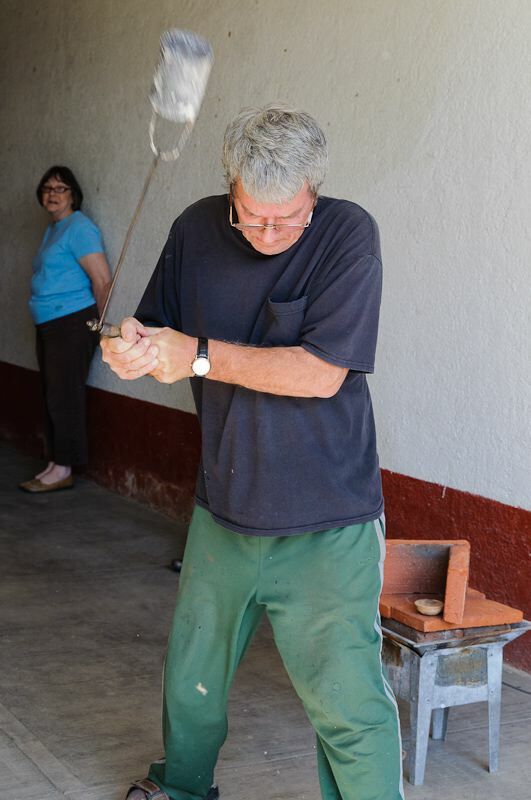 I spent Day Three, Sunday, with master silversmith Ricardo. As a student silversmith, this was a particularly important time for me. 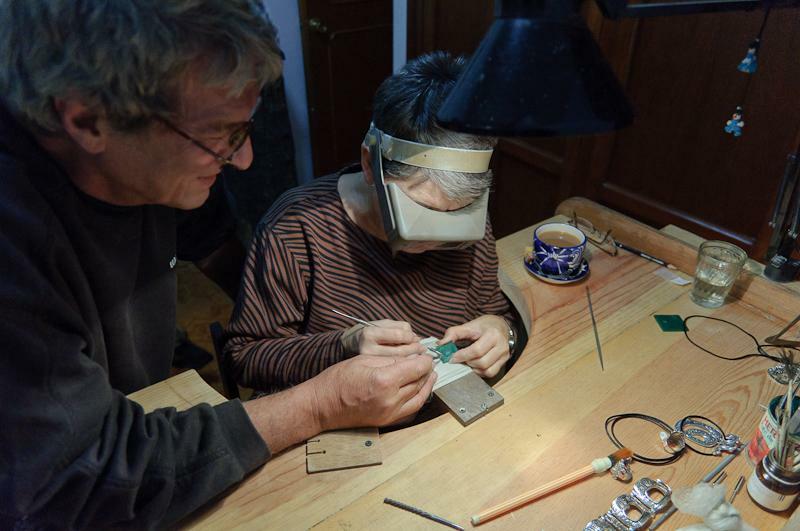 Under Ricardo’s guidance I worked entirely hands-on, from melting and recycling silver into sheet and wire, through to a finished and professional-looking pair of traditional-style earrings. 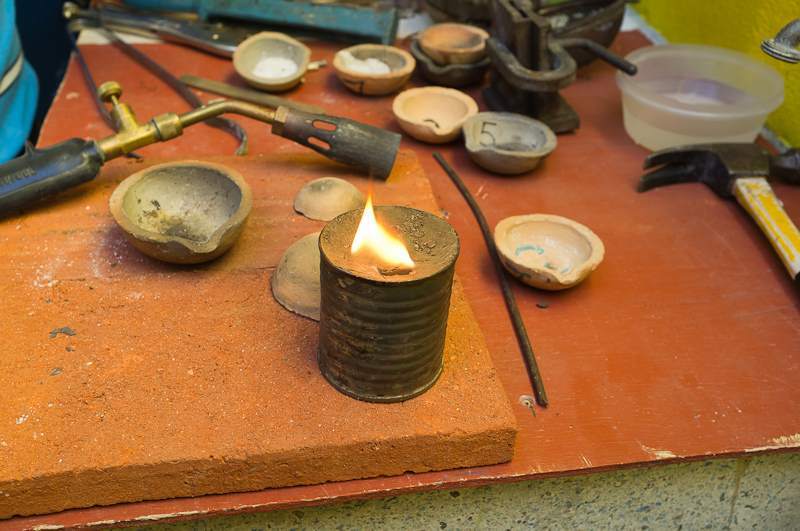 In the process I honed my existing skills and learned many new ones, raising my level from beginning silversmith to intermediate level. I doubt that I could have had one-on-one experience like this anywhere else in the world. 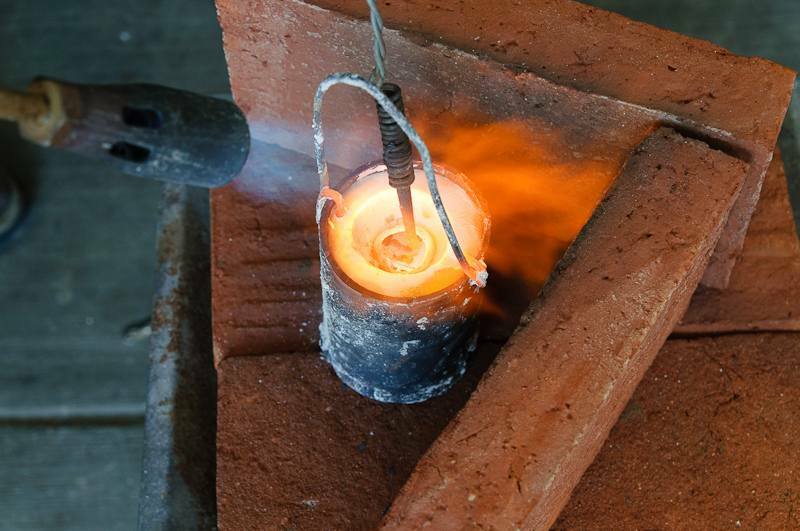 Melting and pouring silver into forms. 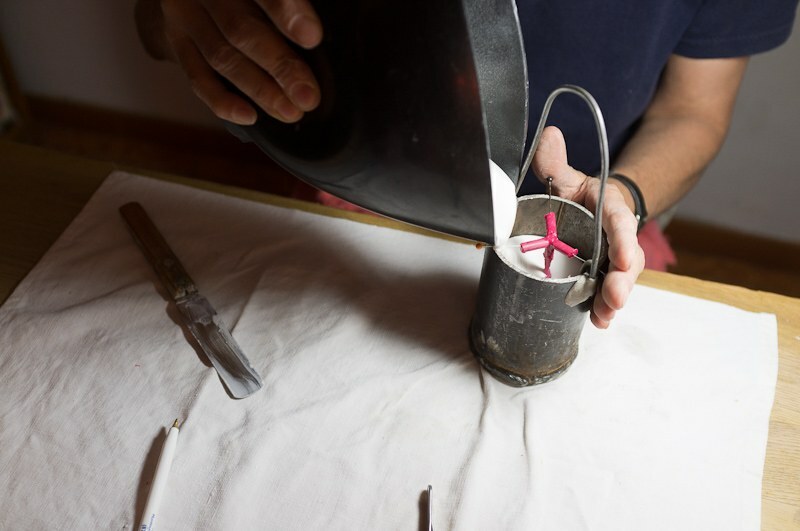 Pressing sheet and pulling wire. Learning the correct way to use a saw. I no longer have fear of making complex forms. Practicing techniques for piercing with drill and burr. Creating texture with dapping and stamping. Making simple granulation and filigree. Because I had some experience, Ricardo guided me through this process. The result: Beautiful earrings that I love, and skills that I can use forever. Thank you, Brigitte, Ivan and Ricardo, for this wonderful adventure! Interested in taking this workshop? Email us! This entry was posted in Jewelry, Oaxaca Mexico art and culture, Workshops and Retreats and tagged design, jewelry, lost-wax casting, Mexico, Oaxaca, sterling silver, workshop. Bookmark the permalink.